The wild is a place, a way to be, a process (i.e. to go wild) and a perception about what happens when wild land and wild waters are paved over, smothered or pulverised. This blog touches on some of the integral viewpoints of the effects of wild and wilderness. Drastic changes along the river, and to the river's ecosystem, have been largely directed by developers responding to government strategies for the need to house the growing population in, and migration to, S.E. Queensland. In this action drama, the Brisbane River and its environs take centre stage as the target for transformation. 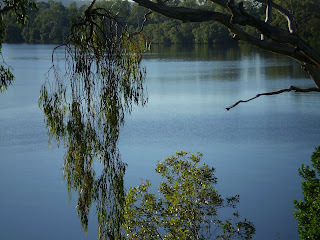 Bushland, mangroves, water quality and water flow are affected, while river creatures, fish, snakes, birds, bats and insects, are forced to make way for a human population, many of whom are increasingly seeking river views, or even 'river glimpses' (quote from recent real estate advertisements). The actors in this river drama are the residents, water users and water policy makers for whom the river seems not to have rights outside of human use, not even the right to its own water. These actors define water in anthropocentric terms, as a resource and development magnet that bypasses intrinsic value and extends storey after concrete storey high into the sky and along the river edge. As a result, the river, its tidal flow and its wild heart are covered with an economically-driven canopy. Thus, in this era of rapid growth, there is little room for salvation of beauty, redemption of aesthetics, preservation of natural capital or for holding onto biodiversity outside of human use. Sustainable development seems a forgotten concept. To explore these notions a little further, I have recently re-visited the work of wonderful Native Canadian novelist Jeanette Armstrong. In her article in Roszak, Gomes and Kanner (1995) titled 'Keepers of the Earth', Armstrong describes the image of non-indigenous people portrayed by her grandparents. They saw white settlers as being out of place, wild and insane, similar concepts to the way that early settlers regarded indigenous people. For example in Australia, colonialists referred to Aborigines as ‘indolent in the extreme, squalid and filthy in their surroundings’, as well as ‘disgustingly impure amongst themselves’ (in Reynolds, 1987:108). Overtones of this attitude still exist today. Aboriginal people continue to be shown in the media as either drunk and violent (wild), sitting in the dirt surrounded by mangy dogs (dirty), or painted up and dancing for tourists (marginal objects). They remain in this picture, a people without agency compelled to live in a static past. To illustrate the impact of these changes place and person, the anthropologist Deborah Bird Rose (1988) cites an Aboriginal elder and one of her Yarralin informants, Daly Pulkara, as saying that once white settlers arrived and began to irrevocably alter the land, it became 'wilderness', i.e. man-made, cattle-grazed, mined, desacralised. It became a place, in Aboriginal eyes, where 'life is absent'. These examples highlight the difference between the way indigenous cultures perceive wild land and wild people and the way non-indigenous western cultures construct notions of the wild and wilderness. For an indigenous culture which has lost sacred land, or has been removed from country, there is a parallel between the dismemberment and despiriting of the land and the despiriting of identity. Aboriginal people are born into an obligatory relationship with the land where caring for country is part of their reciprocal responsibility to place and community. In light of this sacred relationship, Rose (in another article) comments:‘To be in connection is to take care and to be cared for’ (Rose, 2006). Re-memorializing and resacralizing the land through ritual and other community-spiritual processes might create a re-memorying of sacred connection between people and place. Taking care and being cared for are also qualities which have emerged from research into non-indigenous wilderness experiences. Although there are a number of studies into the significance and spirituality of wilderness experiences, particularly on the role of wilderness in therapy, self-development and revitalisation of youth 'at risk' (e.g. the TV series Brat Camp), there is little research on the emotional and spiritual effects of nature engagement in urban areas, such as along the Brisbane River, and limited studies on how people connect with nature in their daily lives, whether in urban or rural areas. This research is crucial as without it planners, officials and developers can cover over green spaces and lop down suburban trees leaving less opportunity in the cityscape for nourishing the human spirit (physical, emotional, intellectual and spiritual). In comparison with a generation ago, urban dwellers have less everyday contact with the natural world. This is driven by an increasing involvement in the virtual world, widespread consumerism, intensification of the built environment, and a decline of public open spaces. Accompanying this external change, there may be a corresponding shift in consciousness and attitudes about the environment. By this I mean that if city dwellers are removed from nature, if they don't know the intricacies of seasonal changes, if they have not fallen for the tidal movements, the glittering water, the delicate bird song, or tuned into the nuances along the river for instance, how and why would we expect them to want to protect this place? Without solid Australian research on spiritual and psychological effects of nature connectedness and nature disconnection there is only limited evidence from which to argue for the preservation and expansion of wild city spaces. And without regular and direct sensual engagement with the natural world, people may not make the link between the lack of nature in their lives and their own wellbbeing and the wellbeing of the environment. Nature in city environments is so familiar we may take it for granted. But it is being whittled away little by little, so we may not notice the change until it is too way late. Get out into nature and help save the earth. Armstrong J, 1995, 'Keepers of the Earth,' in T. Roszak, ME Gomes, & AD Kanner, Eds., Ecopsychology. Restoring the Earth. Healing the Mind. San Francisco: Sierra Club. Bird DB, 2006, 'What if the Angel of History were a Dog? ', Cultural Studies Review: Environments and Ecologies. 12, 1, 67-78. Reynolds H 1987, Frontier: Aboriginal Settlers and Land. Sydney: Allen & Unwin.